Today Buy Day, dax dropped in the first hour to 5250, providing a classic buy setup worth over 10-15pts, same on Ftse. Richbois, do you follow any stocks and do the projected levels work well on these, as in Taylor's days it was mainly trading in stocks. Yes I do follow stocks and it does amazingly work very well. When I feel I cant concentrate enough for futures then I play stocks. Matter of fact did 2 trades between yesterday and today on RIMM but on the Canadian market. This is an email I got last night and I think it is worth sharing here. "On Aug 13 I counted 9 complete 3 day cycles from the July 8th Low, so my question is why is tomorrow (Aug 14th) not BUY DAY? What am I missing in my calculation? Any help you can give me is much appreciated." My answer last night was "If you would have started your book on July 8th then yes tomorrow would be a Buy day. My book started on Feb 1 2008 and the lowest low in Jan 2008 was Jan 22. So that became the Buy day and the rest is history. Once a cycle is established it will never change. I also discovered that 3 day rallies have been positive even in this big bear market we went through. 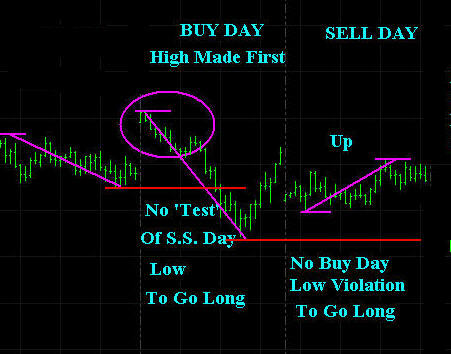 Today when I start a book for a new instrument, I usually try to use as much data as I can, and I confirm the cycle by using the highest positive 3 day rally ratio possible by cycling through the 3 possibilities." Then a few minutes ago I wrote back to show the way that we could both be right and still trade TTT. So based on your possible cycle and based on mine we would have played the same way today. In your case you would have gone short knowing that we need a decline on a Buy day. In my case I had to play the short side because it was SS day. Now Monday will be the tricky one. You will be on a Sell day and expect a rally which may have started already. In my case I am looking for a decline which maybe mostly done. So either way we will be looking for long position at one point or another. I wrote these comments to you right now to try to show you that we could have different cycles and still be able to apply TTT. "Now Monday will be the tricky one. You will be on a Sell day and expect a rally which may have started already. In my case I am looking for a decline which maybe mostly done." I dont get any BdL violation here even in premarket. Having said that, we open close to the BdL and the usual average for a Positive 3 Day Rally should take us higher then yes I was looking to long at the open. Now ES has reached the MA levels I would be more cautious to long.